I've received quite a lot of nice comments from people who've visited my site. And the occasional complaint, usually from someone who didn't think much of my attempts at humor. But there was one group of complaints I couldn't ignore so easily. 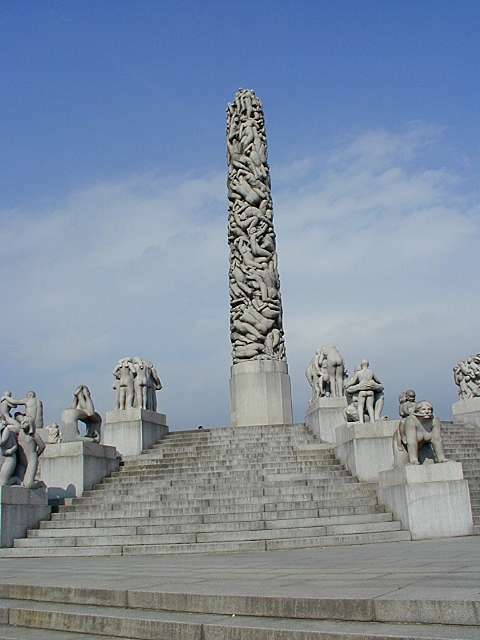 Those came from Norwegian visitors who were bothered by my pictures of Denmark, Sweden and Finland. How, they asked, could I have missed Norway? I had let slip the best part of Scandinavia! 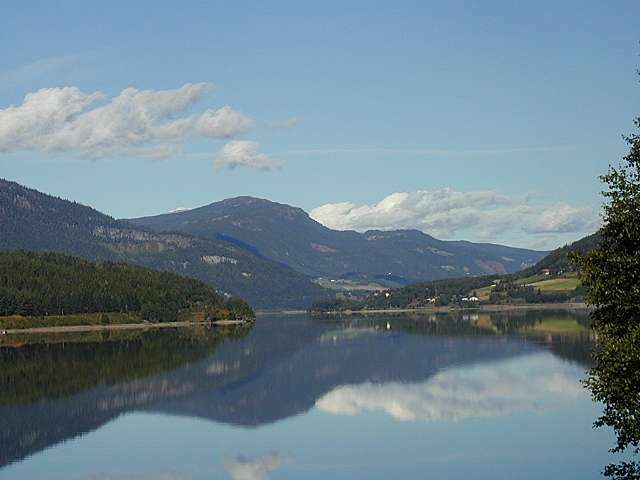 Norway is far more mountainous than the rest of Scandinavia. (Would you believe that the highest hill in Denmark is less than four hundred feet? Not even meters; feet!) But coming overland from Sweden it would take a while before we saw the change. The first sights that impressed me were all the crystal clear lakes, with surfaces so perfect they created a symmetric image of hills, trees and sky. Next was the haphazard positioning of farms on every hill. It seems that every bit of even remotely level land was under cultivation. And so it is; with arable land accounting for only 4% of the country the Norwegians are hard pressed to find enough space to grow crops. Norway is also the only place I've been where prices are higher when produce is in season. Government policy prevents importation of cheaper produce when a local alternative is available. As a result, prices drop considerably as soon as the local product is gone. Which means the cost of living drops to merely exorbitant from completely insane! 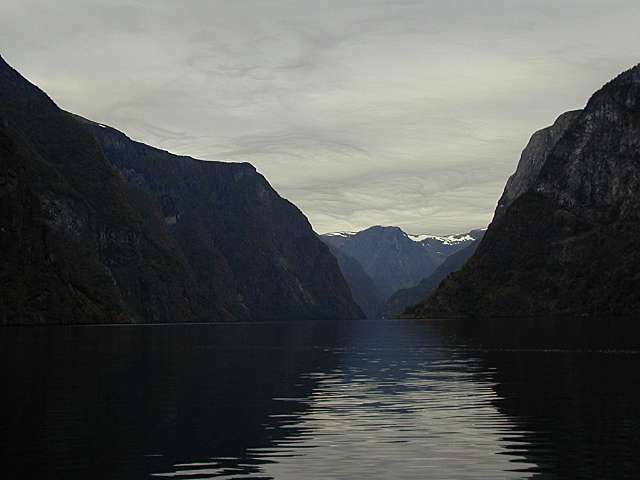 Mention Norway and everyone thinks fjords. (Mention fjords and I think of Monty Python's Norwegian Blue and Slartibartfast's construction efforts on behalf of the mice. But that's me.) 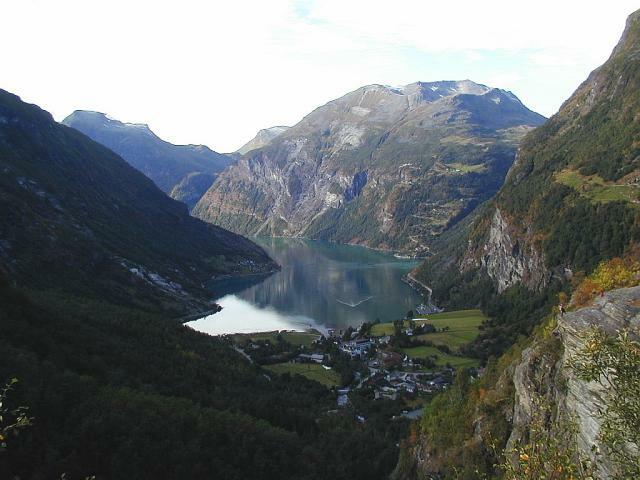 My first fjord was at Geiranger. Even better was the approach, down a road that involved a dramatic series of switchbacks and a descent of four thousand feet. 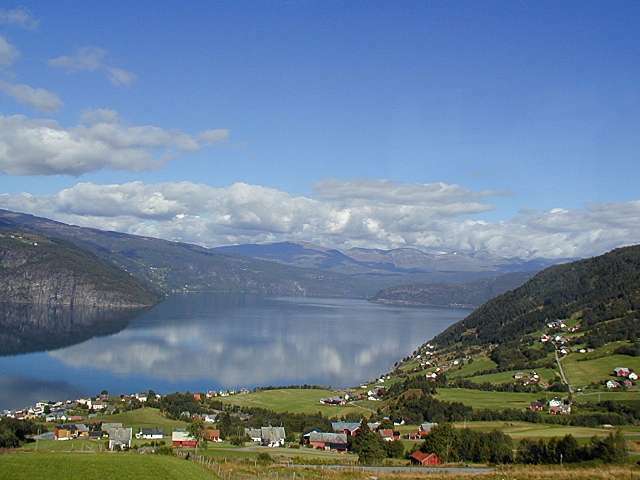 The town, such as it is, lies at the base of the mountains and the edge of the fjord. 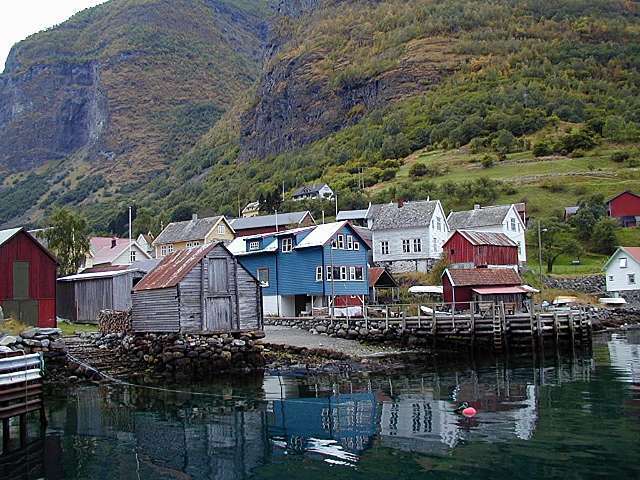 And like a lot of towns in Norway, the only sure way in or out is by sea. Winter stays a long time in this part of the world. (The tourist season ends in September and picks up again in May. Maybe.) And while it's here you can pretty much forget about getting about by road, at least at the higher elevations. My three week journey involved three thousand road miles, not counting all the distance we and our coach covered on various ferries. 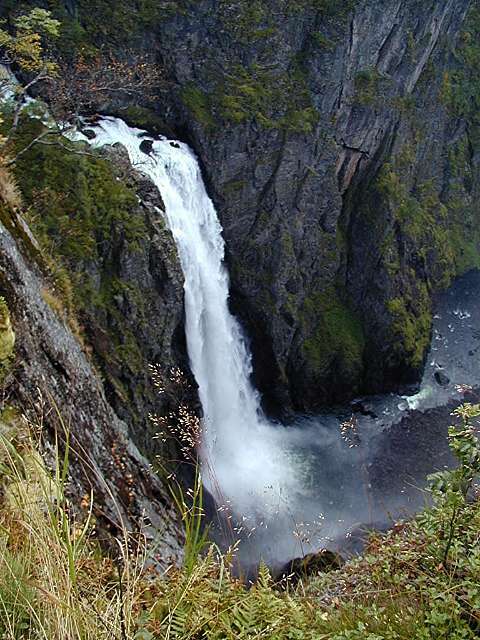 We were parted from our coach only twice: once to give our driver a day off while we braved the road to the Trollstigen or Troll's Ladder; and a second time to take a hydrofoil to Flam, start of a remarkable scenic railway. (Scenic yes. But impossible to photograph.) 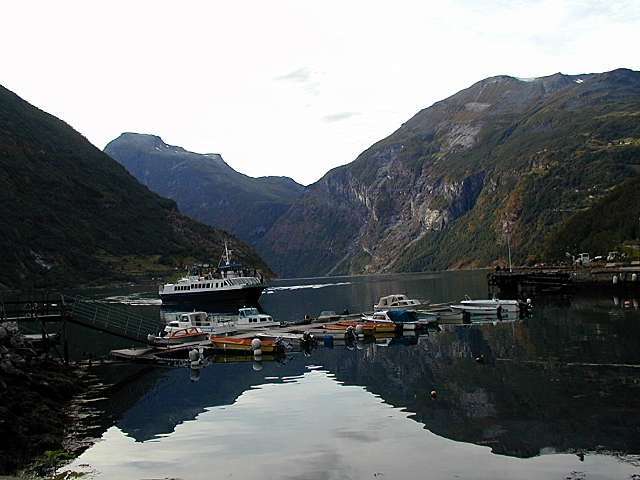 That hydrofoil trip provided spectacular views as it wandered along the fjord from one village to the next. We all jostled for position on the rear deck, trying to ignore the cold wind as we wondered how someone could build farmhouses halfway up these imposing cliffs. Truly determined people, I must say. 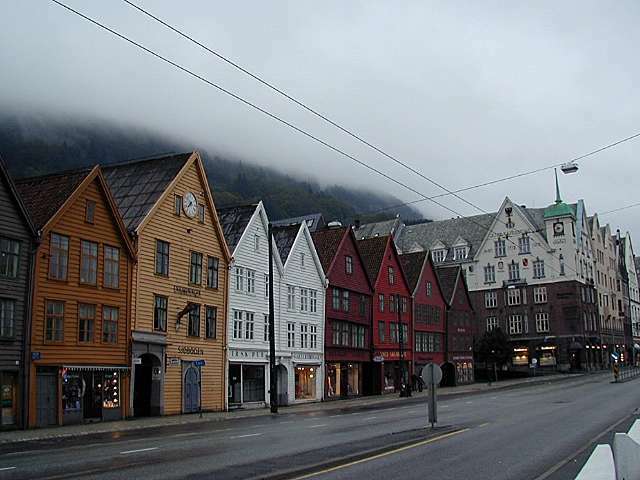 We arrived in Bergen in the rain, which won't surprise anyone who has ever been there. 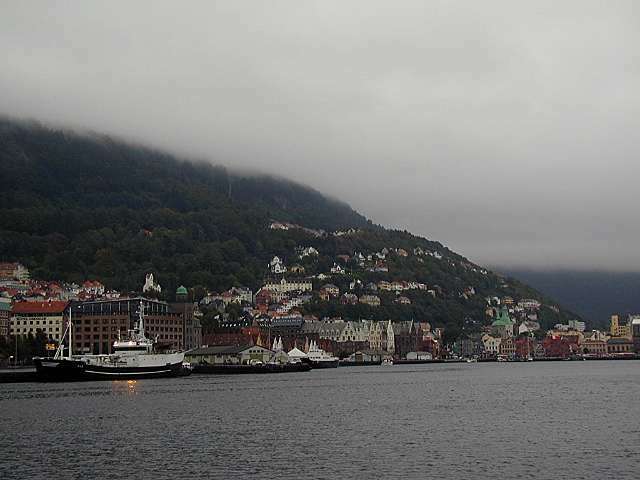 (There's a joke told of a visitor to Bergen who asks a little boy if it always rains there. "I don't know," the boy replies. "I'm only seven.") But a little rain (okay, a lot) won't stop your intrepid reporter. Not when there are such brilliant old buildings along the harbor, each leaning on its neighbor for support. It's a miracle that so much survived the war, what with Allied bombing of German submarine bases in the harbor. (They hit everything except their target.) Or the Germans' efforts at their own destruction. Case in point: their attempt to make repairs on a captured Dutch munitions ship, a welding job that blew the ship into the next world. (The ship's propeller still rests where it landed atop the mountain behind.) Didn't someone notice the No Smoking sign near the powder magazine? Or couldn't they read Dutch? 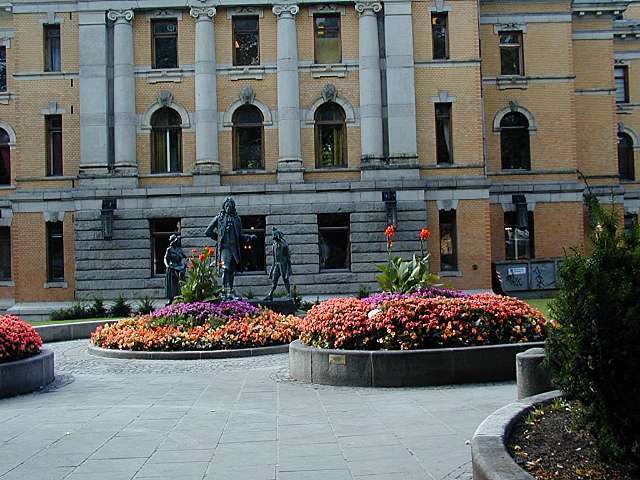 Oslo was a dramatic change from Bergen. And not just because of the weather, although that certainly helped. 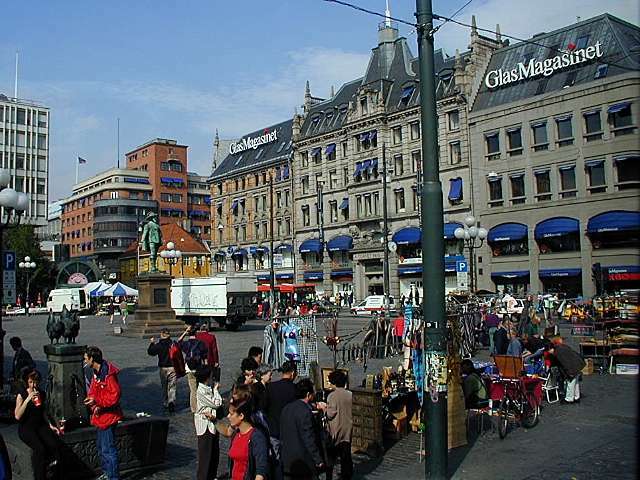 Oslo just feels warmer and more welcoming, with its college campus in the center of town (and all the lunacy a college seems to engender or at least attract) and its broad shopping streets. 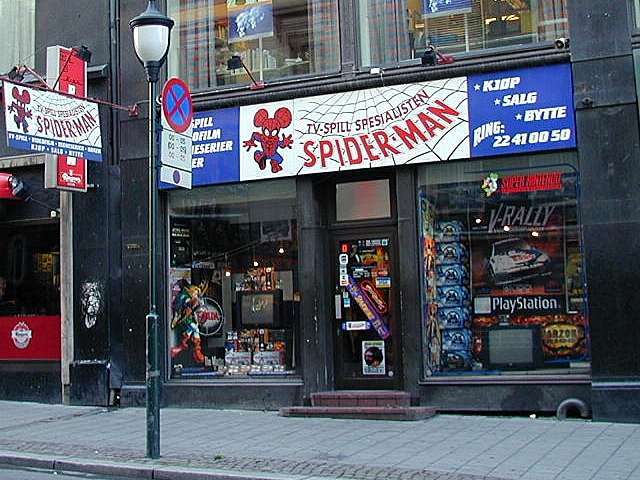 Some of those streets had their little surprises, although none quite so surreal as this videogame store off the main drag. What's the connection to Spiderman, I wondered? And why does he have the ears and body of a cartoon mouse? 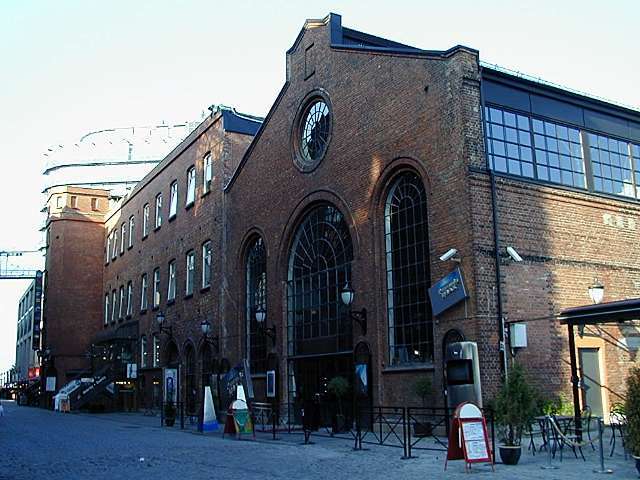 Two examples of Oslo architecture rehabilitated for new purposes. 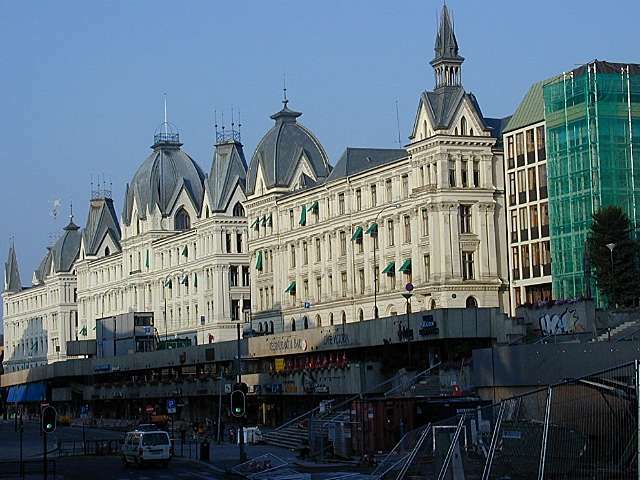 The building on the left once housed a resident evil: it was local Gestapo headquarters during the occupation. (One hopes it's been fumigated.) The one on the right is part of a series of warehouses in the downtown harbor district that have been turned into a shopping complex. This particular structure is an Imax theatre, surely among the more striking one might find. There can't be many Imax theatres made of brick. Straw or sticks, certainly. But hardly ever brick. Norwegians seem somewhat defensive of their Viking ancestors, trying hard to rescue their image from the damage done by popular entertainment. "Sure they raped and burned and pillaged," they will explain. "But not nearly as often as you think. And always in that order, which should account for something!" 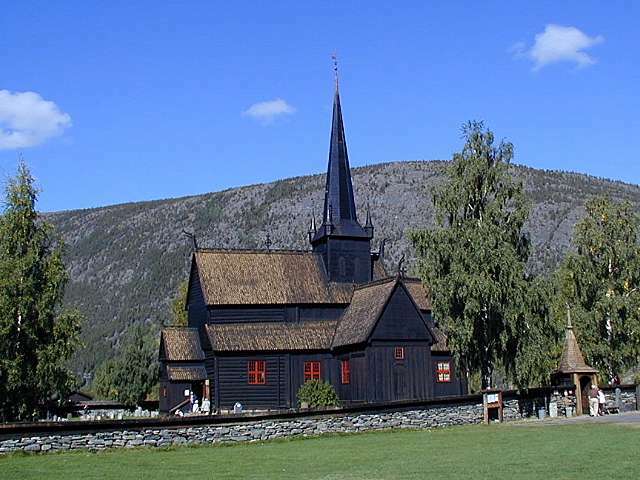 Kidding aside, the harshness of their climate and need for farmland led Norwegians to explore far and wide. Three examples were presented to us one afternoon in the form of three special museums. 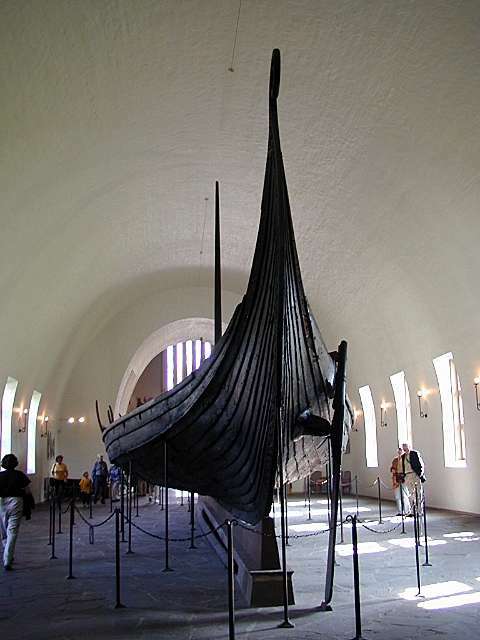 The first had on display three Viking ships that were unearthed from giant burial plots. (Contrary to Hollywood, Vikings didn't send off their dead in burning ships. They buried them. Of course, they buried their possessions along with them, including the odd servant. Talk about tough management contracts!) The ship at left was a sort of royal barge and was buried around the year 900. 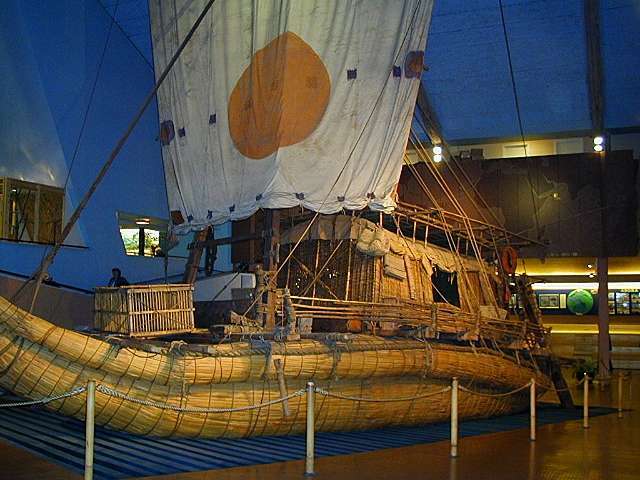 Museum number two was devoted to modern day Viking Thor Heyerdahl and his expeditions across the Pacific Ocean in the balsa wood Kon-Tiki and the Atlantic in the papyrus Ra and Ra II. That's the Ra II on the right; the failure to include a single rope on the tail of the Ra that appeared in the ancient Egyptian plans led to its collapse near the end of its journey. Hence the construction and journey of the Ra II. Museum number three houses the Fram, the ship Fridtjof Nansen used in his attempts to reach the North Pole and which was later used to explore Antarctica. It's clear that Norwegians will go to great lengths to be somewhere else!